I have never eaten a Medlar, but I really want to! I stumbled across this graphic while looking up medlar scionwood online and couldn't help but be intrigued. I planted a medlar tree this past spring in my container garden and it is thriving, so who knows... in a couple of years I may be enjoying my very own bletted medlars! Today we'll be driving across the state to pick up our ram from our friends' farm in Olivet. He's be staying there because we didn't breed last year (due to the England trip) and we didn't want any accidents. In fact, the day they came to pick him up for us I watched him jump a four-foot tall fence (granted it wasn't tensioned well) to escape being caught! Rams are... special. Anyway, he'll be spending some time down in the brambly new pasture I just finished fencing and then in December he (as well as one other possible loaner ram) will get to finally spend some time with the ladies. I'm sure he'll be relieved. I'm hoping the ample grass and raspberry leaves will keep him occupied for now, so that he restrains himself from hopping any fences. At least if he gets out, I know where he'll go! The ewes haven't seen a boy in almost a year so I'm sure they'll be torturing him fairly regularly until it's his time. Poor lad. Before that, however, I plan to make the last two batches of apple cider from the apples that I gleaned from my student's house. Their apples have been spectacular so far, and I can't wait to surprise them with a big jar of home-pressed apple cider next time I see them! 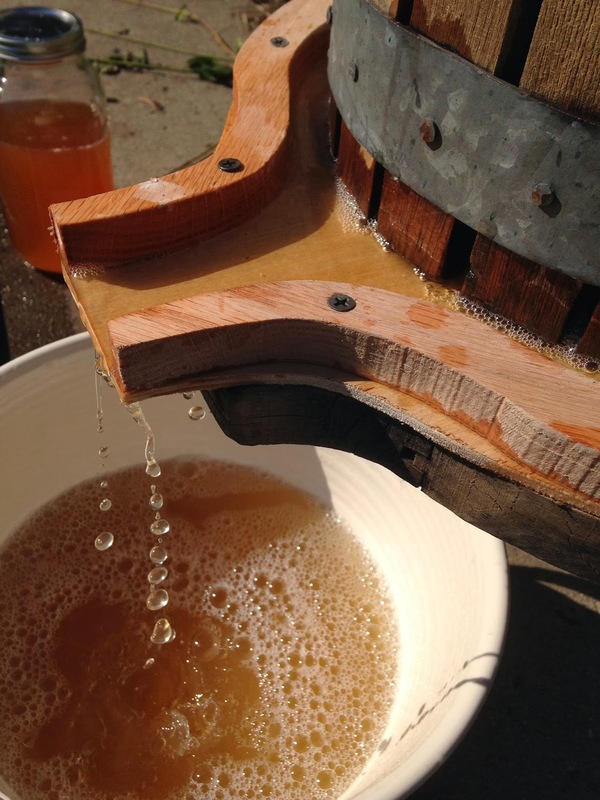 My cider press is an antique press made in Lansing, Michigan. It has a pressed-tin label on it, but thus far I haven't been able to find any information on the company that made it. Ah well. I made a new platform to sit atop the old one since the old one was pretty grungy. I know presses are supposed to have a certain amount of grunge to them, but this one sat unused for several years and I just don't know what kind of moldspore it's been exposed to. Anyway, you can see my awesomely lame carpentry skills in the photo. I have all sorts of improvements planned for next year's press, but I at least wanted to use it this season before getting into all of that. So far I've pressed nearly eight gallons of apple cider, and an additional three of pear. The pear cider turned out amazingly, thanks to the bitter/sour wild pears I found a week or so back. These "perry" pears added tannin and tart flavor to the pear cider to keep it from becoming too syrupy sweet. The pears I was using were awfully soft, as well, so I got to experiment with using hard fruits and soft fruits together to create "channels" between bits of pomace to allow for cider to flow. All in all, I got a nice dry cheese at the end and the cider was/is delicious! I've been canning it to keep it for the winter. I can't wait to crack it open in the winter doldrums for some nice hot, spiced cider! YUM! 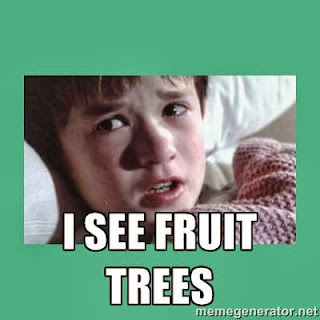 So with the launching of my new project, "The Accidental Orchardist" I have gone full out fruit-crazy. It's like everywhere I drive, I'm watching the silhouettes of trees and I have learned to recognize a fruit tree simply by the shape of it's growth or the degree to which it has shed it's fall leaves. No joke, people. I've lost it. The thing is, there are thousands of pounds of apples and pears sitting underneath these trees and in most cases, nobody even notices! The wildlife can't even keep up, and while the rotting fruit does offer nutrients back into the ground, it also carries fungal spore, larval pests and viruses/bacteria that will further deteriorate the health of the trees. The tree above was pretty much half-choked, entire sections tethered to the ground by grape vines. It's also so densely branched and plagued by powdery mildew that I mistook the powder for dust from the road I was on... and then realized the road I was on doesn't get dusty, and the leaves on the far side of the tree were as evenly coated. So, back to my obsession... Yesterday, alone, I spotted six different trees; some were in yards and some feral on the side of the road. Of course I had to stop and grab a few fruits from each of the feral trees, just in case they're really something special. When we moved to this house (four years ago?) I had no idea how involved I would get with the property. Sure, I saw there was potential for farming. I saw the run-down barn and the creepy gnarled apple tree silhouettes "way out" in the old orchard. This home has come with lots of responsibilities and lots of work to keep up on, and it wasn't until last year that I really realized the potential for the land surrounding our cottage. Of course, last year was a miserable year for apples, and we didn't get a single one (though I did manage to get one single lonely pear, which might have cried while eating.) This year has been intensely bountiful for the apple trees and I am finally able to see just how stressed a beautiful orchard can get. On windy days you can hear cracks coming from the orchards where branches are breaking free, tumbling dramatically to the ground and scattering apples in their wake. In this area of Michigan, apple trees are experiencing a bumper crop this year. Even the orchards with trees that have been well tended and have had fruit thinned have had to be drastically pruned to be saved. The trees in our antique orchard are old and diseased, though not so horribly as to make their fruit inedible. This fall has really showed me that I need to step it up with these trees to keep them healthy. In fact, I need to step it up with the entire orchard. It's no coincidence that the trees where the sheep have grazed for the past few years are the healthiest in the orchard. So I have spent the past few weeks reading and researching antique orchard restoration. This winter our trees will get severely pruned and I hope to attend a grafting class (or two) so that in the spring I can start replacing some of the dead trees. I know my new, young trees will have to grow up in an orchard with established disease and pests, but this is where I live and I intend to nurse them carefully into adolescence. I didn't intend to become an orchardist when I moved in here, but now I think that I can't go back to seeing trees in need, seeing trees heavy with unharvested bounty... and not doing anything about it. This is where my Accidental Orchardist idea started to emerge from my imagination (I think of my imagination as being a sort of disorganized, overstuffed filing cabinet... this idea definitely came from the "harebrained" folder). 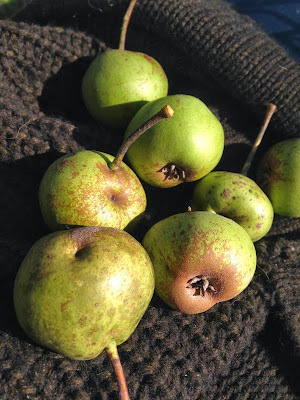 Want to read more about my adventures as an Accidental Orchardist? Check this out here!